ORLANDO, Fla. — An exciting game kicked off the second day of state championship weekend, which saw a rematch of last year’s Class 2A state championship game, featuring two-time defending champion University Christian against Champagnat Catholic. The Christians versus the Lions. 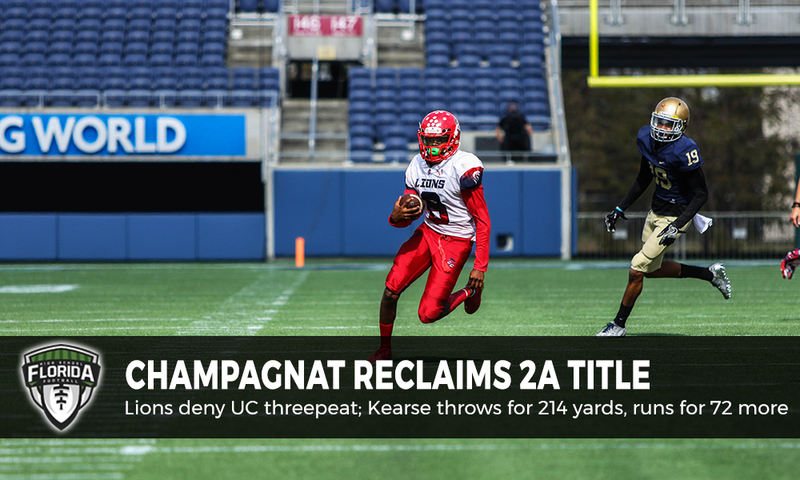 Historically, the Lions had the advantage, and it seems that nothing has changed as Champagnat captured their first state championship since 2013, beating University Christian 24 to 7. It was a matchup of teams that were considered the number one and two teams in Class 2A all season and both schools had combined to win four of the past five game state championships in their classification. And it was safe to say, the game between both powerhouses did not disappoint. As the game kicked off, there was a sense of drowsiness with both teams as the Lions were stopped on fourth down, and then both teams began to trade punts. That was probably due to the 10 AM kickoff and the lack of fans in attendance, and although both teams featured high scoring offenses, we remained scoreless nearing the end of the first. Then Clayton Boyd woke things. The senior quarterback lofted one to running back Jalen Dunnigan, and the senior captain ran almost untouched into the end zone on a perfectly blocked screen pass to put the Christians up 7-0. Champagnat quarterback Desjuan Kearse, not wanting to be outdone by Boyd, led the Lions on a ten-play, 84-yard drive that ended in a touchdown after Calvin Montgomery ran through a trailer-sized hole on the right side. The Lions would not convert their two-point conversion and were down 7-6. The quarterbacks for both teams were the driving forces behind each offense, and after Kearse’s impressive drive, it was Boyd’s turn once again. The senior kept the ball on a read option and almost took it to the house on a huge 52-yard run that had the Christians set up in good field position. That was about as far as Champagnat would let them go, however, and when University Christian went for it on fourth and one from the Lion 11, the defensive line dragged Dunnigan down for no gain and stopped a potential Christian scoring drive. This gave Kearse and Lion offense a chance to take the lead into the half, and they would not disappoint. Champagnat went on an eleven-play, 93-yard drive that was capped by a short touchdown run. Miami (FL) commit Gregory Rousseau caught the two-point conversion on a fade, and at the half, the Lions were up 14-7. Both quarterbacks had excellent first halves, Kearse by air and Boyd by ground. The game would be decided by which defense could start to limit the opposing team’s QB. Champagnat certainly decided at halftime they were sick of getting torched by Boyd, and sacked the captain two out of the first three plays, and forced the Christians to punt. The University Christian defense still seemed to be in a bit of a lethargic state, and left receivers wide open for Kearse twice on Champagnat’s first drive of the half, only for those balls to be dropped. The Christians dodged a bullet and took over after the Lions punted. After University was stopped on fourth and one at midfield and another dropped ball doomed the Lions to another punt, the game was still 14-7 in Champagnat’s as the third quarter ended. Aside from a few big runs from Boyd, University Christian really didn’t have much offense throughout the game, and that was ultimately the deciding factor. Boyd was able to get the Christians to the Champagnat side of the field on their first drive of the fourth, but then was sacked, and the Lions took over. A slow, four-minute drive that was kept alive because of a scramble by Kearse resulted in a Duke Jones field goal from 26-yards out, giving Champagnat the 17-7 lead with only five minutes remaining. Despite admirable play from their quarterback all game, University got stopped on fourth down on their next drive, and then a Kearse touchdown pass to Marc Britt with only 2:11 left was the dagger for the Lions. The entire Champagnat team mobbed each other in the end zone after the game, a fitting celebration for a team win. When asked about the performance of Kearse, who threw for 214 yards and a touchdown, Marroquin said: “Dejuan did a great job for us, used his legs to get that first down and helped set up a field goal, which really took their momentum away”. The Lion’s roster contains a lot of underclassmen, and they should once again be in contention for a state title next season. But right now, they’re going to enjoy their first state championship since 2013.